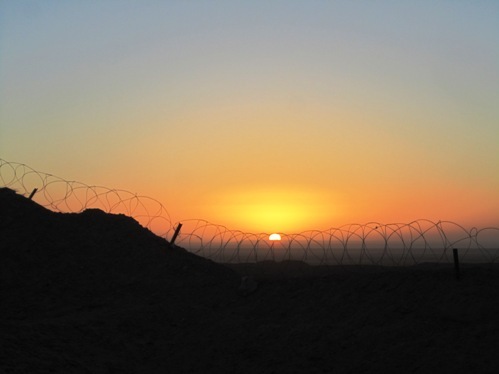 COMBAT OUTPOST PAYNE, Afghanistan — It’s well after dusk here in the desert, but I wanted to take a minute to share how my day began. As you can see above, there’s one hell of a sunrise on the right day downrange. I’m still struggling to adjust to the time zone difference, so I awoke today about 4 a.m. — more than early enough to wait for the day to begin. The sun peeked over the horizon, exploding in a series of pink, orange and rose hues. I took it in, grabbing this image from behind the safe confines of COP Payne. That’s the silhouette of concertina wire standing proudly in the foreground.